A very smart, leather seat stick with contemporary painted brown frame and leg. 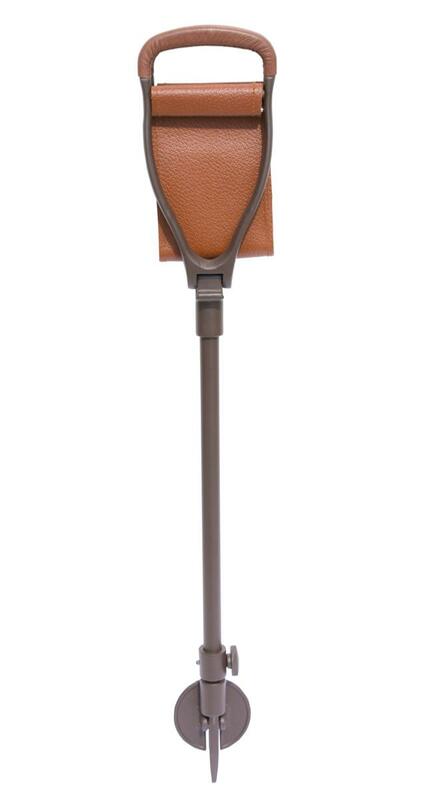 The Equerry seat stick adjusts in height from 77 to 94cm, with a corresponding sitting height of between 60 to 77cm. The seat width from the outside edge of the handles when opened is 45cm with a depth of 11cm, making a wide and comfortable seat. Fitted with a simple height-adjustment mechanism and a folding ground plate to avoid it sinking into soft ground when sat upon, this seat stick makes an excellent gift or addition to the country wardrobe. A rubber ferrule with square aperture is available separately, ref. 3716.